Jr. David LaDuke starts off his Friday in economics looking at supply and demand graphs. At lunch, he and his friends talk about their weekend plans. One of his friends has a track meet, another is seeing a movie, but LaDuke plans to travel through jungles and fight with minions. LaDuke plays the phone game Vainglory semi-professionally. 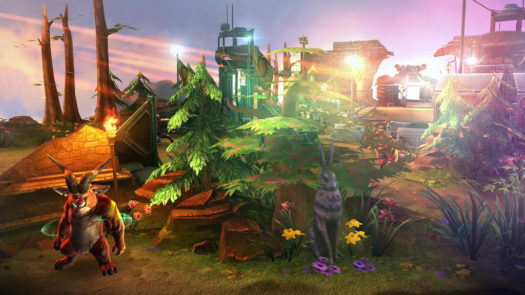 Vainglory is a multiplayer online battle arena (MOBA) game similar to League of Legends and Dota 2: Two opposing teams fight to destroy each other’s bases while defending their own in a tug of war for control over three lanes which connect the bases. In addition, there are “jungles” between the lanes filled with creatures to kill. In Vainglory, teams of five control an avatar, known as a “hero.” Weaker computer-controlled characters, called “minions,” spawn at the bases and follow the lanes to the opposite team’s base, lining the lanes are turret towers that repel the flow of minions and enemy heroes. The objective: to destroy the enemy turrets and ultimately the “vain crystal” in the enemy team’s base. LaDuke started playing Vainglory in January 2016. “I found the game looking around on the App Store for a way to pass time,” LaDuke said. He was instantly hooked. He steadily improved and earned himself the highest rank: Vainglorious. “I worked at it for one and a half years.” LaDuke said. To achieve this, he was practicing about three hours every day in his room. Others noticed LaDuke’s talent. “A guy I was playing with needed a fifth player to play some ranked matches with his team.” The guy, Plato, invited LaDuke to sub for the team known as Login Station, which is based in Mexico. LaDuke excitedly joined and blended easily with the experienced team. With Login Station, LaDuke participated in his first tournaments. “There wasn’t a lot to do, so we started playing anywhere we could.” The tournaments were small, but LaDuke was gaining important experience. Shortly after, LaDuke’s teammates disagreed with how the team was being managed. Two of the five players chose to leave and create their own team. Unsure of his future, LaDuke searched for a new team. He went once again to Plato, who started a new team. Lucky for LaDuke, the team needed a substitute. He joined, and even though he was a just a sub, he was happy to be playing again. His new team, 99 Problems, took off. They entered another small tournament and placed third. Following their success, the team attempted to enter the North American Champions League (NACL), where thirty-four teams compete over five weeks. Once again, the team didn’t last long. “My teammates weren’t happy with where the team was headed,” LaDuke said. Plato and another teammate quit Vainglory altogether. Two of his other teammates made their own team, and the final took a break. This left him alone once again. Desperate for another team, LaDuke went to Discord, which is like Skype for gamers. Within Discord, he entered a chat involving all semi-professional Vainglory teams. He sent out a message saying he was available to play. After two weeks of waiting and practicing, the team Nightless contracted him for their fifth player. He joined the team of experienced players. LaDuke thought this would be his last team because everything was going well. But again, LaDuke hit a speed bump. “There was an announcement saying that the prize for the Vainglory Premier League would be cut,” LaDuke said. The team looked forward to competing for the jackpot, but with the cut, they felt all the hours of competing wouldn’t be worth it. Within a day, his entire team quit. LaDuke didn’t give up. He went back to 99 Problems. This time, his team’s goal was to compete in the World Electronic Sports Games Canadian Qualifier. The thought of another failed attempt at a tournament scared LaDuke, but he stayed positive. As the day of the first match approached, two of his teammates notified LaDuke that they couldn’t play in the first match. He quickly scrambled to find two replacements, and he did so in two friends who had experience in the game. “I was pretty confident we could get to the finals, so I didn’t think it would be an issue,” LaDuke said. Somehow, LaDuke yet again wasn’t able to compete. One teammate said he wouldn’t play the day before the match. Out of options, LaDuke couldn’t play. Again and again LaDuke was let down. He is skilled at playing Vainglory and staying positive, but he seems to have endless bad luck. As long as LaDuke keeps playing he is bound to have success, but for the meantime, he should probably avoid walking under ladders and maybe try knocking on some wood.